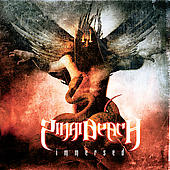 "Immersed" is a crushingly heavy metalcore CD, loaded up with destructive guitar, intense vocals and songs that seem intent on knocking something down. Then, every once and awhile, along comes an almost haunting break, in which the sounds -- for the briefest of moments -- like a church choir. A split second later, however, and Sinai Beach are back to annihilating anything in their path. The metalcore genre is kind of like the pop punk genre in that there are so many metalcore bands and so few that really stand out. "Immersed" is different enough to make it one of the stand-outs, but only just barely. Metalcore fans will probably find it immensely entertaining while those who stay away from the genre won't find enough here to draw them in. Sinai Beach: Mike Dunlap - drums; Logan Lambert - guitar; Courtney Alderson - all vocals; Mike Risinger - guitar; Jeff Santo - bass. For more information, check out http://www.myspace.com/sinaibeach.